Wave energy conversion is a field of endeavour which has been witness to commercial enterprise at unprecedented levels over the previous decade. There are however numerous road blocks which stand in the way of developers, not least is the cost of conducting pre-commercial tests to assess designs. To date most large scale deployments have been conducted with a single wave energy converter, however there is a necessity to expand this to ‘arrays’ or ‘farms’ in the future. There are numerous hydrodynamic implications which require consideration in this evolution from single device to arrays. These can largely be characterised as either intra-array or extra-array effects. Where intra-array effects describe how devices within the array effect each other and extra-array effects describe how the array alters the natural wave field in the far field. The Phd project being discussed here forms a part of a larger project titled Australian Wave Energy Atlas. One goal of this project is to develop best practice guidelines on physical impact assessments for wave energy developments in Australia’s marine domain. To achieve this a case study is being conducted around Carnegie’s Perth Wave Energy Project using their CETO5 technology, a submerged bottom referenced heaving buoy. The work of this PhD is to conduct model scale experiments using Carnegie’s CETO 5 system. This experimental data shall then be compared with the aforementioned full scale deployment and a selection of numerical investigations, including both phase averaging and phase resolving. 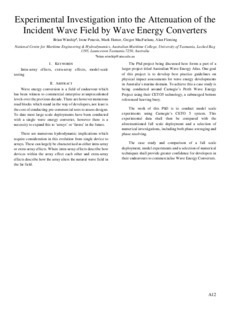 The case study and comparison of a full scale deployment, model experiments and a selection of numerical techniques shall provide greater confidence for developers in their endeavours to commercialise Wave Energy Converters.